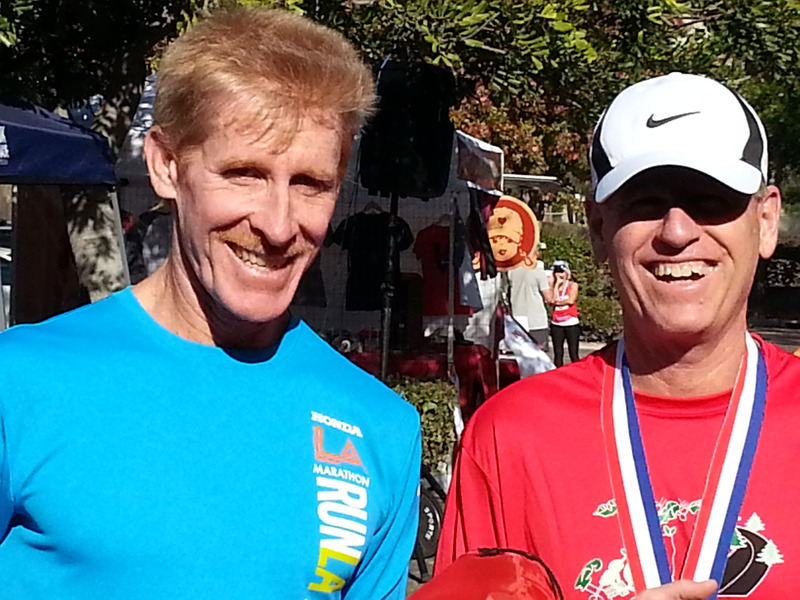 Clay and I headed down to Camarillo for the Holly Jolly Half Marathon this morning. The course looked to be flat and fast enough for a good race. Looking at last year’s results it looked like age group awards were a definite possibility. Of course, there was one little problem that limited my confidence. My knee has been bothering me since the Veterans Day Race – November 11. I have not run more than 15 miles in a WEEK since November 11. My “Chronic Training Stress Score” on Training Peaks has dropped from 64 to 50 – a loss of more than 20 percent. (Click here for my post explaining CTS) I have been intending to supplement my running with cycling to maintain fitness – but we have been through a very cold spell of late. I just could not bring myself to go for a bike ride at 40 degrees. Yesterday, I set a cautiously optimistic goal of 1:40. As we drove to the race it became apparent that wind would also be a factor. Turning on the news they announced Santa Ana winds. These are winds that come from the east to the LA basin bringing hot, dry gusty conditions. Weather.gov says that there was 15 mph winds from the east with gusts to 22 mph. It seemed to me that no matter which way we turned we were fighting a headwind. As you can see from the map you would be fighting an east wind the first two miles. You would get a mile reprieve and then you fight it again till almost mile 5. Then you have 1 mile of downwind running. At this point, though the gusts seemed to have died. Both Clay and I just remember feeling hot in this section. After the first lap I wanted to quit, but I hung on for the second. From a racing point of view, though, the race went quite well. Clay and I were part of a lead group or runners for about 3 miles. There was a young lady slightly ahead, then Clay and another guy, then another guy, and girl and me! The pace was not great. I started out with miles in the low 7s, but that especially tough 5th mile was a 7:38. The stress of fighting the wind was taking its toll though. My hip adductors did not have the stamina to maintain the pace. As I started the second loop, one more lady caught me, but I could see no one else for a long ways coming up behind. 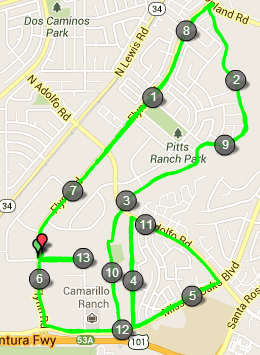 So I did not stress over maintaining any particular pace the second loop. I just pushed it as much as my legs would deliver. 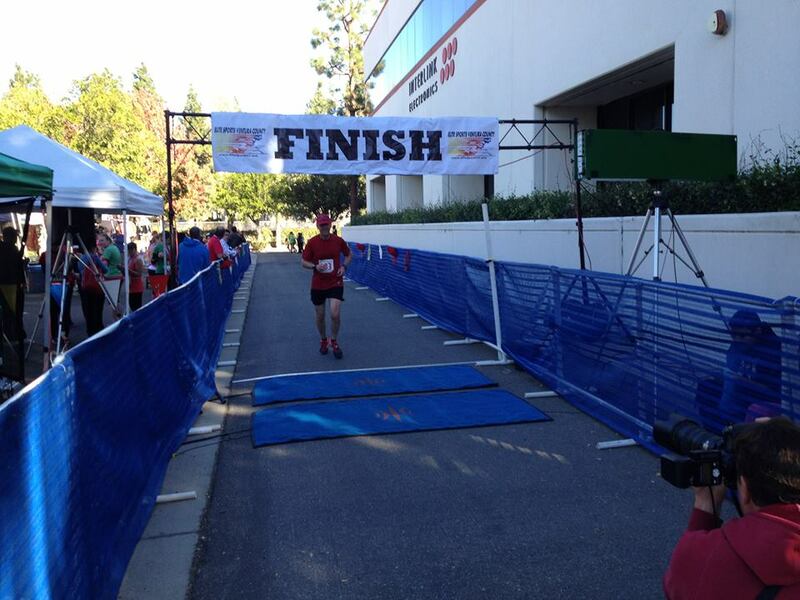 No one caught me on the second loop and I finally finished in 1:43:48. This was my worst half marathon time in years! But, I was the 4th fastest guy out there today. Clay was 3rd in just under 1:39:32. Clay’s 3rd place male finish earned him a very nice 11 points in the Grand Prix Points Contest. My 4th place finish was worth 10. I already had a score of 7 from the Bakersfield half back in January, so the 7 was replaced by the 10 and the Bakersfield became worth the 2 point half marathon minimum. This was a net gain of 5 points for the day! I was 2 points behind Cade Ruble, but this moved me past him back into 4th place in the points contest. Click here for the full list. Clay’s 11 points moved him into 10th place on the list… for a while… when I checked my email I had 4 races submitted by Jim Pandya which bumped Clay back to 11th. Everyone got a medal at this race. Top 3 overall finishers and age group winners scored goodies instead of placing medals. Clay got a small back pack for 3rd overall. Then he got a nice sportsbag and a foldable camping chair for winning his age group. I got the same sportsbag for placing 2nd in the age group. Then I won the same chair in the raffle! Good job considering your limited training!